It would seem that Cooler Master simply wanted to create the best performing AIO coolers available. In that respect, they certainly managed to do so, as their Nepton series coolers are constantly at the top of our high load thermal performance charts. On the other hand, one would have to be at least partially deaf in order to use these coolers with the fans anywhere near their maximum speed. Even with their voltage reduced down to 7V, both kits are rather noisy. It is not possible to run these kits quiet even if you reduce the voltage even further, as the fans are clearly audible from 1 meter away even at just 4.7V, the minimum voltage required to start them. Therefore, we simply cannot recommend them to anyone seeking a quiet cooling solution. The Seidon 120V however is an entirely different product. Priced at just $49.99, it is more of an alternative to an average air cooler than competition for liquid cooling solutions. It fares relatively well at lower loads but its performance diminishes with thermal loads greater than 150W. 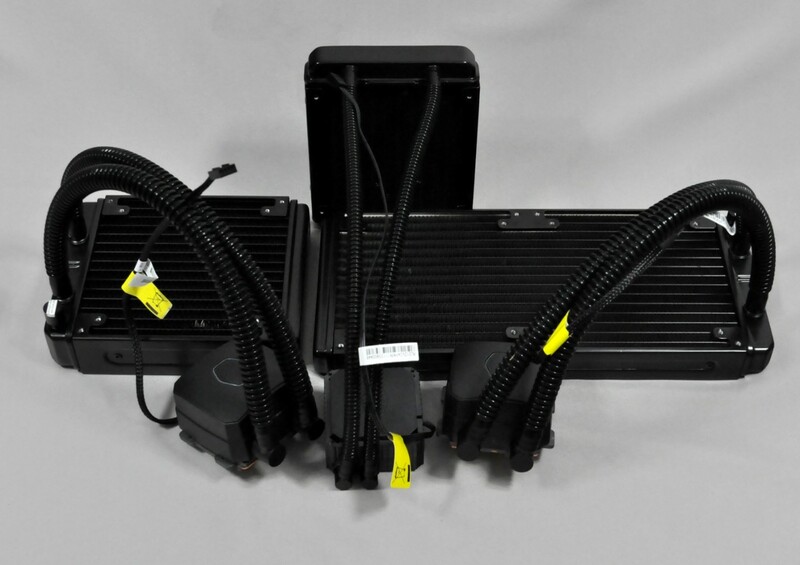 With an average thermal resistance slightly above 0.014 °C/W, it will most likely be unable to compete with most extreme performance air coolers, and it has a particularly noisy pump, making it noisier than other 120mm AIO coolers. However, it has other merits, as it does not stress the motherboard with its weight and it requires very little space around the CPU area, making it ideal for special builds and/or systems that are moved around a lot. 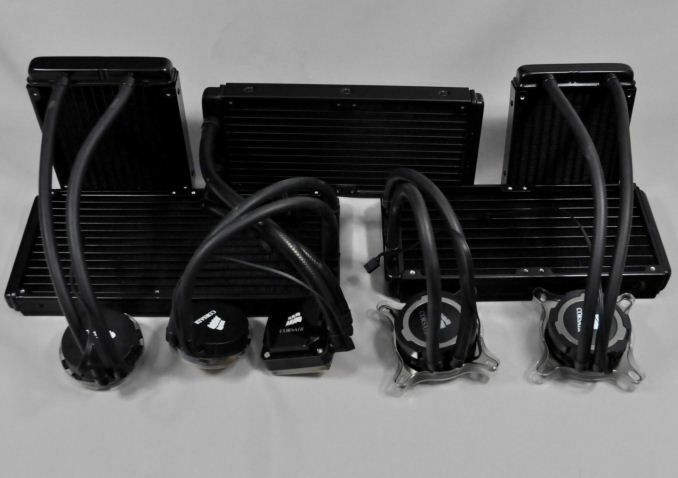 Corsair has such a vast selection of AIO cooling products that we could make a roundup just for them. Each of the five coolers that they shipped us for this roundup displays entirely different behavior; thus, each of them is suitable for a different type of user. With the H75 Corsair is offering a compact 120mm AIO cooler but with two 120mm fans for extra performance. The H75 performs relatively well, although it generally does better at thermal loads lower than 150W due to the low capacity of its small radiator. The use of two fans however increases the noise of the system, giving the advantage to Enermax's Liqmax 120S if low-noise operation is the top priority. The 140mm H90 on the other hand displays great all-around performance and very low noise levels. Even with its fan constantly running at maximum speed, the H90 can be considered fairly discreet and is comfortable for everyday use. If quiet computing is what drives you, the H90 deserves a very strong consideration. Corsair informed us that the H100i is their most popular AIO cooler and we can see why. Despite its size, the H100i easily competes with coolers using significantly larger radiators. The stock fans have a wide operating range and the USB interface allows the user to adjust the performance/noise ratio to meet his or her exact needs. Furthermore, the size of the radiator makes the H100i compatible with a relatively wide array of cases. After looking at the performance figures of the H100i, we felt disappointed by the performance of the newly released H105. The H105 hardly performs much better and it only does so when the thermal load is very high. Unfortunately, the thicker radiator can create compatibility issues and it also is more expensive than the H100i, all while lacking the USB interface that the H100i has. It is hard to recommend the H105 over the H100i for the slightly better thermal performance alone, unless of course maximum thermal performance is virtually the only concern of the user and a larger radiator cannot fit into the system. Finally, the last AIO cooler from Corsair that we have tested, the Hydro H110, possibly stands as the performance winner of this roundup. Although it does not have the best thermal performance, it is very close to the top of the charts and manages to do so while maintaining very low noise levels. However, the size of the radiator limits the compatibility of the cooler with only a handful of cases currently available and, considering that the retail price of the H110 is over $125 at the time of this review, it is a costly thermal solution.